Was essen wir an einem hektischen Arbeitstag? Wie wirkt sich der Verzehr von Speisen im Vorbeigehen oder am Schreibtisch auf unsere Gesundheit aus? Und wie können Arbeitgeber für eine gesündere Ernährung ihrer Mitarbeiter sorgen? Wir gehen diesen Fragen nach. You are what you eat, so they say. And since most employed adults spend between 50 and 60 per cent of their waking hoursZeit, in der man nicht schläftwaking hours at work, it makes sense to combine that with eating well. But how many people find time for healthy eating in their busy working lives? And how many work-places help to provide good food? According to NHS (National Health Service)staatlicher GesundheitsdienstNHS England, British workers consume at least a third of their daily calorie intakeKalorienaufnahmecalorie intake while at work. Eating the wrong food or not drinking enough water can lead to headaches, tiredness and poor concentration. A healthy dietErnährungdiet means a better general feeling of well-being and greater workplace performanceLeistung(sfähigkeit)performance. The United Kingdom has some of the highest reported levels of obesityFettleibigkeitobesity in Europe. Linked to diabetes, heart disease, strokeSchlaganfallstrokes and some types of cancerKrebscancer, it is estimated to cost the British economy almost €18 billionMilliarde(n)billion every year. According to Deliveroo, one major problem among British workers is a lack of imagination. With its recent “lamelahm; hier: wenig anregendLame Lunch Amnesty” campaign, the food delivery firm reported that most British workers stick to the same unhealthy routine every day. Favourite lunches include buttered toast, sausage rolletwa: Bratwurst im Schlafrocksausage rolls and pastyPastetepasties. Sandwiches rule the office — with ham being the favourite filling. The Daily Express wrote of another worrying trend: secret snacking. It reports that half of all office workers secretly snack at their desks, mainly on crispsKartoffelchipscrisps, sweets and pastry(Gebäck-)Teilchenpastries. Most people claim that they need the snacks to increase their energy levels for their jobs. The University of Surrey has produced researchForschung, Untersuchungenresearch showing that eating food considered a snack rather than a meal leads to higher food consumption because snacks are not thought to be fillingsättigendfilling. People eating snacks on the go (ifml. )unterwegs; hier auch: im Vorbeigehenon the go, rather than seated at a table, consume 50 per cent more than their colleagues. “When we don’t fully concentrate on our meals and the process of to take sth. inhier: etw. verzehrentaking in food, we fall into a trap: fall into a ~in eine Falle geratentrap of mindlessgedankenlosmindless eating, where we don’t to track sth.etw. verfolgen; hier: den Überblick über etw. behaltentrack or recognize the food that has just been consumed,” says Professor Jane Ogden from the University of Surrey. commuterPendler(in)Commuters are especially likely to overeat. The Huffington Post reports on research from the Royal Society for Public Health showing that commuters add an extra 800 calories to their diets each week. Commuters are less likely to spend time preparing healthy meals and there’s a financial cost, too: according to the Mail Online, British commuters spend almost €3,000 a year on takeaway coffee and hot drinks, lunch and other snacks. Taking a proper lunch pauseMittagspauselunch break is essential to help stop the snacking and overeating. In the US, where 15-minute lunches are the new normal, deliveries from Uber Eats and other meal providers have replaced the traditional lunch break. Too few workers eat fresh fruit, vegetables or salads, but according to the food-ordering service Seamless, there is a desire for change. Their research shows a massive 81 per cent of employees prefer healthy options such as salads, wraps and fruit to be served at company meetings and events. Seamless’s yearly food surveyStudie, Umfragesurvey says that food perkAnreiz, Vergünstigungperks are now an essential tool in employee recruitmentAnwerbung, Einstellungrecruitment and retentionBindungretention. Across the US and UK, organizations are recognizing the added value of meal discountPreisnachlassdiscounts, in-housefirmeninternin-house cafeterias or food-ordering services, free drinks and snacks, healthy snacks and in-house sit-down lunches. The Huffington Post recently identified business giants Dropbox, Apple and Google as top providers of excellent workplace food. The benefits of in-house catering are easy to see: less time and money wasted searching for takeaway food, a focus on healthier food and lifestyles, increased rapportgutes Verhältnisrapport through sharing meals with colleagues and the creation of an organizational identity. Companies are promoting initiatives such as healthy office cookbooks, shared meal events, healthy snack boxes and fruit bowls. They are also taking simple steps like making sure there is sufficient cutlery and dishes with which to eat a healthy lunch. UK employers such as shoe-repair chain Timpson have adapted their cafeterias to healthy eating and no longer sell chocolate and crisps. Marks & Spencer began its healthy in-store catering programme “Refresh” in 2007 for 59,000 staff across 444 stores. Its healthy eating campaign focused on low salt, fat and sugar content, “five a day” targets and better staff training. It included encouraging staff and customers to drink more water — something that many workplaces continue to overlook. You are what you drink, too. Coaching-Methoden werden inzwischen auch erfolgreich zum Erlernen einer Fremdsprache eingesetzt. Lesen Sie hier, was es damit auf sich hat. 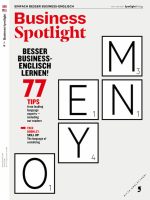 Consultant Nicole Anzinger spricht im Interview über Veränderungen in Unternehmen. Diese Prozesse verlangen Flexibilität – aber auch die Möglichkeit, Fehler zu machen. Die Schlafforscherin Sofia Axelrod hatte anlässlich der Geburt ihres ersten Kindes so viel Angst, um ihre Schlafqualität, dass sie eine Methode entwickelt hat, mit der Kinder und Erwachsene sich nachts besser erholen.